Where will you be in 5 years? Really? How about, where will you be tomorrow? Your business world is moving and changing at a rapid pace. You do good work and want to leave a lasting impression on the global landscape, but anticipating future needs requires clarity and a dedicated focus. How can you best position your business today to benefit from new opportunities and those still on the horizon? Become more effective. Identify areas of need and create momentum to ignite your purpose. Simplify the complex. Align your vision and establish a common problem-solving methodology. Build confidence. Energize your people, spark curiosity and create breakthrough leaps. Innovation is the bridge between continuous development and breakthrough leaps. Each time we change an aspect of our business, we are innovating. Each day we learn something new — whether through reading, experience, participation or observation — we're increasing our ability to think innovatively. Accountable For Change offers a variety of materials to help you keep learning and growing, all focused on building a better business. We invite you to view our videos, explore our blog, download presentations and check out the latest news. You can even take advantage of free diagnostic tools to help you uncover your areas of greatest need and assess your readiness to make successful change. Successful implementation of project initiatives puts profit back in your pocket. It’s a great feeling when we spend months working on an initiative and all goes well — we are ready to proceed, we have both the organization and individual capabilities in place and our beliefs are aligned. How often does that occur in your business? What is the benefit to you of projecting your success rate when implementing new initiatives? 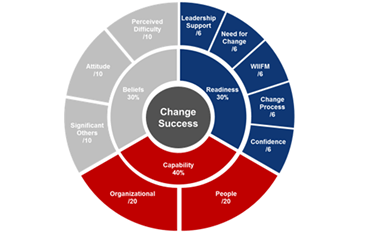 Our Change Success Diagnostic tool will help you determine your probability of success for any sized project — be informed before you leap. Crystallizing your vision for your business takes concentrated time and energy. That's hard to come by, when you're focused on meeting day-to-day needs. How do you quickly and strategically identify the business issues that represent either challenges or opportunities? Our Growth & Profit Solutions Business Diagnostic tool offers perspective by evaluating 10 key success factors. Sue was an invaluable part of the team in helping our client find the right vision and strategy. Her thoughtful approach brought insight into our client’s needs and ultimately helped us provide a higher level of strategic advisory service. She recognized barriers to the client’s success and worked to bring us and our client together to develop the way forward. I thoroughly enjoyed working with Sue and would not hesitate to work with her again. Sue helped me develop a 90-day fast track plan to improve our cash flow. As Chief Strategy Officer, I am always looking for ways to improve our team. We set up project teams to execute the plan and Sue provided the accountability. Our people grew in their confidence and that translated into cross department momentum. The ideas came forth and together the project teams made a difference. 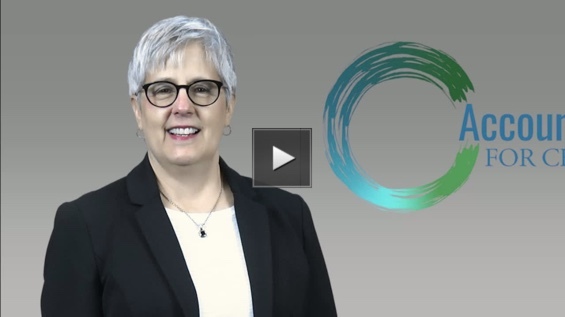 Sue provided the tools that enabled our team to pivot our thinking, reevaluate goals, strengthen strategies, and come up with a WORKABLE, DOABLE plan. I am so glad Sue is on my team, helping me build a better business for me, my colleagues, and my clients. I rely on her for high-level strategic concerns, as well as getting down in the weeds to work through specific business problems. AFC provides us with actionable tools & processes that help us work on key initiatives, many of which we use on a regular basis such as decision matrixes, performance standards for key result areas, mindmaps and white space reports. I have found this to be far superior to other coaching methodologies that lend lip-service to reaching for developing BHAGs. Ready to get started? Send us a message and a member of our team will reach out to discuss your needs. Why Choose Accountable For Change? Accountable For Change gives you access to tailored business insights along with the specialized tools, training and resources that empower you to make successful change. © 2019 Accountable For Change. All Rights Reserved.